Heart-shaped gemstone is 4x4mm. 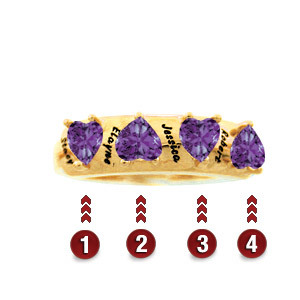 Each gemstone is 3-prong set. Engrave up to seven characters or spaces next to each stone. Ring measures approximately 5.5mm at the widest top measurement. Available in 10kt or 14kt, yellow or white gold.